<gasp> This stuff's made in Needham, Mass? 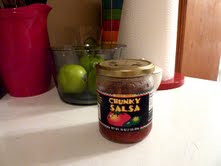 Well, this stuff ain't made in San Antonio, but I still think it's a good salsa. Actually it's only sold and distributed from Needham, Mass., and I'm not sure where it's made. Could be New York City for all I know. In this case, it looks like our good friend Trader Jose hopped the border and made straight for the northeast. I'm happy with it, but I am a yankee, and I apparently cannot be considered a connoisseur of fine salsas. To me, it seems chunky, just like the label says, and it has plenty of flavor. It's got just a little kick, but it won't burn your mouth. Now my wife, who is 1st generation Mexican-American, has the authority to declare this a good salsa, despite the fact it's made in (or at least distributed from) New England. And she actually likes it more than I do. So that says something. I think they have hotter versions of the same salsa. I guess this is the mild variety. There's a little graph in the shape of a chili on the side of the jar that shows you how hot it is, and the chili is 1/3 red. I'm guessing medium is 2/3 red, and so on. I'll have to try the hotter ones too at some point. For this kind, I give Four and a half Stars. Sonia gives Five Stars. Bottom line: 9.5 out of 10. I have this in my refrigerator at this moment!